Can a Princess Be a Firefighter? is a children’s book written by Carole P. Roman and illustrated by Mateya Arkova. When a child asks her parent if a princess can be a firefighter, she is offered many occupational suggestions, some of which are roles usually thought to be filled by men. Judges, dentists, cowpokes, mimes and more cause the little girl to question which of the many endless occupations she could fill when she is old enough. What worries her the most is that she may have to retire her fairy wings in order to fulfill certain roles, such as a lawyer, construction worker or crime-fighter. With so many career paths available, the young girl is excited to have so many choices, and has several years ahead in which to decide what she would like to be when her studies are complete. I truly enjoyed this story, not only in the way it is written, but also in how the illustrations show what each occupation entails. Carole P. Roman has listed so many possibilities of what a young child could become, regardless of their gender, with each choice creating much thrill and excitement. Long gone are the days where the only option for a girl was as a secretary or a housewife. Female astronauts, truck drivers, dancers or doctors are some of the many careers available to her, should she wish to pursue them, and, with none making her any less feminine than she is, the child is thrilled at the possibilities. Many avenues and pathways are now attainable by both genders, creating many fulfilling and wonderful career opportunities for this and future generations. 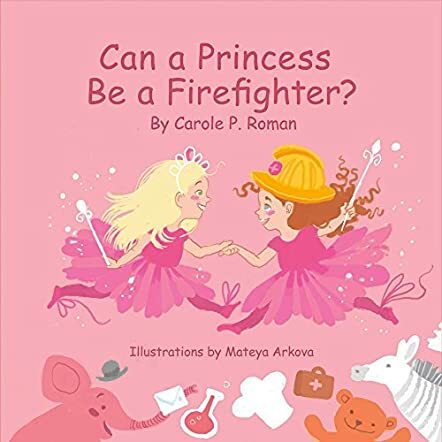 I recommend Can a Princess Be a Firefighter to children aged 4 to 12, as it lists the seemingly endless list of career possibilities open to them. I love this book and everything that it stands for. As a father, it's important to encourage our daughters that they can be anything, and do anything which they set their minds too! Beautiful book.